The TRUSU Flying Club is hosting an event that brings travel tips, film and 15,000 hours of flight experience together. The “Three Hours Aboard” event will take place in the afternoon on Saturday, Nov. 5 in the International Building. 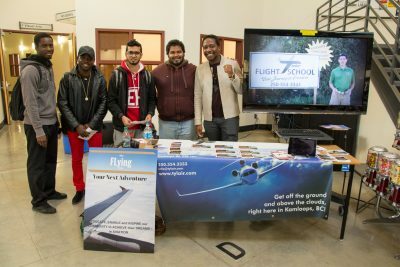 The free event has three main features: a presentation by fourth-year tourism student Abdul Alessa on how to travel for cheap, a film on aviation and then a talk with retired pilot and flight instructor Daniel Nelson. Nelson has over 15,000 hours of flight time and has been teaching people how to fly for 40 years. There will also be a draw at the event, with prizes including two seats on a flight over Kamloops and a 30-minute session in a flight simulator, courtesy of Tylair Aviation. The club has already seen success, according to its leaders. Its first event, which took members on a tour of the Kamloops flight traffic control room and the airfield near Tylair Aviation, was attended by 30 people, double the club’s expectation. “Fifteen people registered, but 30 showed up, which was a shock. But we had a lot of fun,” founder of the club Damoon Hossin said. “It gives us a really good feeling to do the second event and I wanted to make it bigger,” he said. Talking about the club in general, Hossin said that the club is looking for student members from all programs and has collaborated with artists, marketing students and other clubs on campus. Hossin is a fourth-year computing science student and also a pilot with over 100 hours logged. After graduation, he hopes to become an airline pilot. Other executive members are also student pilots. The club combines interest in aviation with RC enthusiasts and has members interested in skydiving as well. Takudzwa Chibaya, one of the club’s organizers, wants to create diversity in both activities and nationalities among members and to leave a positive impact with it. “The only way that I’d love to see the club grow is just to see people actually putting this diversity to practice,” Chibaya said. Some paid events that Hossin would like to see happen in the future is a group flight from Kamloops to Chilliwack, stopping at an airport café famous for their pies. If there is enough interest, he also hopes to see a skydiving session done in the future. Those interested in attending can find more information on how to register on the TRU Flying Club’s Facebook page.